The team building Halton’s landmark new Mersey Gateway bridge has won a national competition that recognises excellence in ecology and environmental management. Some of the Mersey Gateway environment and liaison team celebrate their award win with the new bridge being constructed in the background. 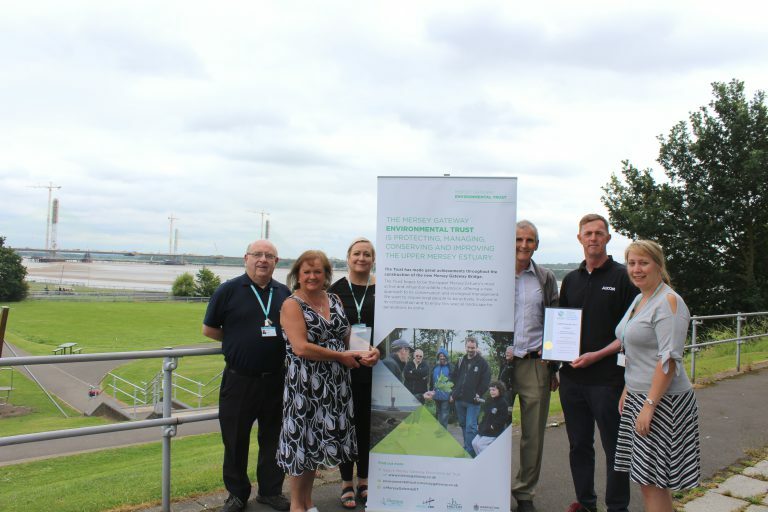 Pictured, from left to right are, Keith Bold, Merseylink volunteer, Elaine Newall, Third Parties Liaison Manager, Mersey Gateway Crossings Board, Karen Nicholson, Liaison Officer, Merseylink, Paul Oldfield, Environment and Diversity Manager, Mersey Gateway Crossings Board, Damian Smith, Senior Ecologist, Merseylink and Victoria Pollard, Environmental Manager, Merseylink. The project team triumphed in London yesterday (Wednesday 21st June) in the stakeholder engagement category at the Chartered Institute of Ecology and Environmental Management (CIEEM) Best Practice awards, and was also highly commended in the knowledge sharing category. The CIEEM awards, highlight outstanding examples of environmental management on large-scale projects. Dr Mark Hampton, the project’s lead ecologist, said the awards recognised the highest standards of professionalism in environmental management across the project site and from Merseylink and its partners AECOM and the Mersey Gateway Environmental Trust. “Preserving and improving the natural environment surrounding the project and wider areas was a priority from the beginning,” he said. To win the Mersey Gateway team had to demonstrate how it met a number of criteria, including how sensitive environmental issues were resolved. “We demonstrated how we had worked with regulators to ensure the construction of the haul roads on the saltmarsh at the start of the project did not interfere with bird nesting season,” he said. “Throughout the project we’ve taken steps to ensure transparent and timely access to information for the project stakeholders such as Natural England, the Environment Agency, the Marine Management Organisation, the Local Planning Authority and research institutions. “We’ve made it our priority to inform, consult, involve and collaborate with these organisations, but also to foster interest and engagement from the local community. Leader of Halton Borough Council, Cllr Rob Polhill, congratulated the team on the award. “I’d like to say well done to everyone involved. This is recognition of the extremely high standard of work that has been demonstrated from the project team since this project began,” he said.